Since the reforms that followed the Second Vatican Council, the church has evinced a renewed interest (some might call it an obsession) with the language of the liturgy. The council fathers understood the importance of language and took the bold step of voting to allow the use of the vernacular in the liturgy. That decision, as graced and wonderful as it was, also unleashed an avalanche of verbosity that hit some local parishes harder than others. The impulse to explain and comment on even the smallest liturgical detail may have been inspired by good will, but a barrage of words quickly wearied congregations, some of whose members were tempted to pine away for the old days when Father mumbled under his breath in Latin. The recent Vatican promulgation of Liturgiam Authenticam (2001) and Summorum Pontificum (2007) highlighted different concerns regarding language. Liturgiam Authenticam focuses on the regulation of translations, while Summorum Pontificum reduces restrictions on the celebration of the Eucharist in Latin according to the so-called Tridentine Rite. This strong focus on the literal translation of Latin texts and the increased leeway to celebrate the old Latin Rite have kept language at the center of much liturgical debate. Many of the concerns raised are important and deserve attention. The liturgy—because it is ritual activity—speaks in many other ways, however, than simply through words. These nonverbal ways of speaking are often neglected to the detriment of meaningful liturgical prayer. The language of liturgy is more than texts on a printed page read aloud at the proper time. 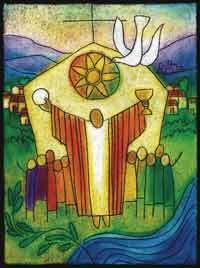 The language of the liturgy, itself a symbol, also includes other symbols and symbolic actions. All elements of the liturgy (bread, wine, cup, water, fire, book, vesture, altar, crucifix), all gestures and postures (processing, bowing, eating, drinking, signing, singing, sprinkling, standing, kneeling) and all environmental elements (art and architecture, color and texture, light and darkness, sound and silence) can be said to make up the matrix of symbols that constitute the liturgy. The dynamism of this interplay of symbols can perhaps be more easily understood by considering a fundamental principle of quantum physics. As Diarmuid O’Murchu explains it, quantum physics describes the universe as a place where everything is interconnected or interrelated. Connections are realized by energy concentrated in packets, called quanta, that flow throughout all of reality. Like the bundles of energy described in quantum theory, liturgical symbols interact with each other, transferring and increasing energy, shedding light and unfolding meaning. The meaning of which they speak concerns Christian faith and identity, our relationship with God and each other and our participation in the paschal mystery of our Lord Jesus Christ. If we hope to promote full, active and conscious participation in the liturgy, more care and attention must be given to the way we celebrate the nonverbal symbols of the liturgy. In addition to promoting participation—one of the primary goals of the liturgical reform—such care and attention will also enable nonverbal symbols to speak the message of the Gospel with greater clarity, integrity and inclusivity. There are various dimensions to active participation. Sometimes it calls for fulfilling a specific role, such as that of presider, cantor, altar server or choir member. For most of us, however, participation involves assuming the role of the worshiper in the pew. Even so, the congregation does not adequately fulfill its responsibility for active participation by simply responding to the prayers or singing the hymns and acclamations. The greater responsibility comes later: it is the response of one’s life to the compelling invitation of the Gospel message. That invitation can be made more compelling through the interplay of symbolic activity that captures both the hearts and the imaginations of the worshipers. Oftentimes a dissonance can be set up between the text of the liturgy and its nonverbal symbols. The text of the Easter Vigil rite, for example, proclaims “Christ our light.” Instead of experiencing this great mystery in the midst of genuine darkness, we often sing the proclamation in full daylight. Or in other cases, only the altar servers see the ritual blessing of the Easter fire that flickers out of sight in the rear of the church. Another example would be the many Communion hymn texts that speak of eating Christ’s body and drinking Christ’s blood. Such a message is contradicted when the cup is withheld from the congregation and only the host is distributed. This is even more problematic when the Eucharist includes a large number of concelebrants, who partake of the cup in full view of a congregation that is not given the same opportunity. The assembly that gathers to celebrate the Eucharist each Sunday has been told by means of a variety of verbal messages (including Scripture, the fathers of the church, the General Instruction of the Roman Missal and papal and curial statements) that it is the body of Christ. Furthermore, the worshipers are told that it is baptism that incorporates them into Christ’s paschal mystery and is the source of their call to ministry and their individual dignity as temples of the Holy Spirit. Their unity as a gathered assembly is essential to the experience of and witness to these truths. These messages, however, will be nothing more than words unless they are supported by the many nonverbal symbols through which the liturgy can speak these truths with eloquence and grace. These include the sprinkling rite, which serves to remind members of the assembly of their baptism and its link to celebrating the Eucharist. Even things as simple as the placement, size and beauty of the baptismal font speak of the centrality of this sacrament to Christian life. In addition, including the congregation in the incense rite highlights the assembly as one of the modes of Christ’s presence. Other significant nonverbal symbols include the postures and movements of the assembly. The General Instruction is both clear and emphatic when it states that “a common posture, to be observed by all participants, is a sign of the unity of the members of the Christian community gathered for the sacred Liturgy.” But posture can become a source of dissonance when a common posture is not observed or when the opportunity is not provided to take advantage of the options acknowledged in the General Instruction as appropriate in certain circumstances. Of course, it is also the case that recent changes in the observance of rubrics have sometimes made it more difficult for nonverbal symbols to speak with clarity and authenticity. Numerous texts (in the categories mentioned above) speak about one bread and one cup symbolizing our oneness in the one body of Christ. Yet today our altars are covered with countless cups and plates full of small hosts before the celebration of the fraction rite. Such actions can make our words incoherent and the fraction rite superfluous. The reforms of the Second Vatican Council teach us that celebrating the Eucharist is not an action performed solely by the presider and watched by the congregation. Rather, the Eucharist is an action performed by a gathered assembly under the leadership of an ordained priest and with the assistance of a variety of ministers. Parish liturgy committees often puzzle over why they cannot convince their assemblies that this is the case. Perhaps it is because nonverbal symbols and symbolic gestures are communicating a different message. When all the ministers who serve in proximity to the altar handle objects of quality and beauty—liturgical books, sacred vessels and the like—while the assembly sings and prays from throwaway missalettes that look shabby after the first weekend of use, it is not surprising that the congregants do not perceive themselves as integral to the liturgical action. If we want to signal the fact that the eucharistic action is occurring within the entire assembly, why not decorate all areas of the church for festivals such as Christmas and Easter—sanctuary and nave alike? This past Palm Sunday I attended Mass in my hometown of Buffalo, N.Y. At the door of St. Joseph’s Church, greeters offered each person a copy of the reading of the Passion. In my past experience, the assembly is usually assigned the parts of the rabble-rousing crowd, the “bad guys.” To my surprise and delight, however, the congregation was assigned the part of Jesus Christ. Just think about that for a moment. Usually the part of Christ is automatically assigned to the priest. But in this case, the church community took the part of Christ. Such a gesture says volumes about how this parish (or the liturgy planning team) understood the assembly as the body of Christ, truly an instance of the presence of Christ in that time and place. The message, both verbal and nonverbal, was loud and clear. Nonverbal symbols should not only speak in harmony with the verbal messages of the liturgy and faith in general; they also need to speak words of hospitality and inclusion. In a church where cultural and social diversity are fast becoming the norm rather than the exception, our gestures, postures, music, art and architecture can both express the heterogeneity of a community and welcome new members with their unique gifts and heritage. A tone of respect and appreciation can be heard in the way a parish or diocese incorporates the richness of its diversity, not with token gestures but with genuine hospitality and openness. This requires patience, planning and a willingness to learn new music, new customs and new ways of expressing our Catholic tradition. Perhaps if only one suggestion could be made to improve the way nonverbal symbols are celebrated in the liturgy, it would be to work at developing a sacramental imagination or a sacramental worldview. In other words, we need to develop an ability to recognize the invisible workings of the divine presence active in the mundane elements of everyday life. Then, within the liturgy, these elements need to be celebrated with largesse, with a magnanimity that acknowledges that they mediate a sacrum commercium, that is, a sacred exchange between God and humankind. No other response than this type of prodigality is appropriate in the face of the boundless generosity of God. Reducing symbols by either artificiality or miserliness inhibits their ability to serve as sacraments of our encounter with the divine. This is one of those clear cases where less is not more. Instead, we need to use plenty of water and oil for baptism, burn real candles, decorate with fresh flowers, process with grace and dignity, begin the Easter Vigil in the dark, build dramatic Easter fires, make music that erupts from the depths of our being and enter into communal prayer with generous amounts of silence. Communal silence is one of the primary ways we can learn to see all of liturgy’s symbols as expressions of God’s activity in our lives and in our rituals. We can know our Christian faith only in and through our bodies. Yet our spirits need the deeper silence that dwells in the sacred mysteries; we enter it by pondering these signs and living into them. Opportunities for silence include not only longer pauses after the readings or after Communion, but also those moments when, gracefully and unhurriedly, we move from one ritual action to another. Silence will enable us to contemplate and become open to the myriad ways in which nonverbal symbols speak to us of God and invite our response. We must pay closer attention to the nonverbal symbols of the liturgy and celebrate them well. In addition to our experience of liturgical texts, and oftentimes even more powerfully, they enable us to get in touch with the presence of God that, like the illusiveness of energy, permeates all of creation but can be apprehended only when it is embodied. My husband and I have travelled the tri-state region seeking such an integrated liturgy as Dr.Kubicki describes, and have found precious few. We salute her forthright presentation of possibilities honoring the various components of a prayerful experience whether it be the celebration of Eucharist, sacrament or quiet space for personal time with God. We believe that liturgy is the foundation of our faith and that all that we are as Catholic Christians flows from this communion. It is our energy to minister to each other and to the world. This needs to be the priority in every parish as we strive to be an Easter people, witnesses to the Risen Lord. Thank you Judith Kubicki for sprinkling us with hope and direction. This article also appeared in print, under the headline "More Than Words," in the May 26, 2008 issue.